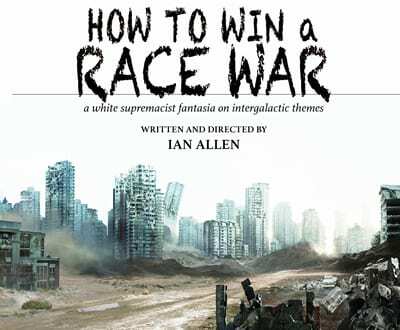 Things take a darkly hilarious turn with the highly-anticipated world premiere of Ian Allen's How to Win a Race War. The three-part comic satire, replete with song-and-dance numbers, clocking in at 3 hours plus, is a parody of white supremacist "race war" fiction. Spanning more than 3 centuries of civilization, How to Win a Race War takes the audience on an epic journey from one end of the white supremacist bookcase to the other: from the fear of slave rebellions in the antebellum South, to the militant skinhead scene of 1990's Boston, and waay beyond - into a liberal dystopian future packed with the sort of orchestrated chaos we are seeing from these dangerous groups today. "...And when applause grows more robust at the conclusion, it may be only because it signals the end of this ugly, deeply failed experiment." "...'How to Win a Race War was written and directed by Ian Allen (who wrote the wonderful 'Laura Bush Killed A Guy'). Mr. Allen included in the program a New York Times opinion piece he wrote and that was published on July 30 of this year. This piece is well-written and lays out his architecture for the show." "...From what I can tell, based on my non-existent experience with the "literature" on which the play is based, How to Win a Race War doesn't obviously comment on or complicate any of the messages being espoused in the original work. Because the original text is so (thankfully) niche and obscure, it's nearly impossible for the average theatergoer to recognize which parts are satire and which are documentary. With this layer of remove, the audience isn't implicated in the goings-on onstage; they are alienated rather than made complicit."